Monday night the Bar Chill Tent became the venue of the first Spirit of the Game Conference presented by Rise Up. The low attendance of about 30 people out of the 3800 athletes attending the championship could mean two things. Either people are relying on the fact that there will be video they can watch later or the community simply doesn’t think there is much more they can learn about SOTG, let alone having to listen to a two hour presentation about it. Ryan Purcell (President of the WFDF Athletes Commission) presented seven panels of speakers that looked at different perspectives of SOTG and I’m struck by how much I have forgotten about the essential part of the ultimate sport. First speaker is WFDF Task Force’s representative Rueben Berg who once again explains the new WFDF concept of ensuring the players’ compliance with the rules – the Game Advisors (GAs). 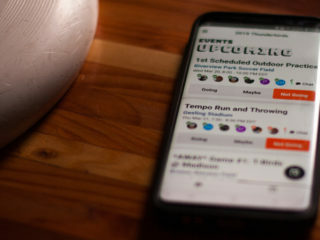 He talks about the roots of the initiative and making sure that ultimate can be established as a spectator-friendly sport. He also explains that the role of the GAs will eventually be slightly different from the one they have at Worlds in Lecco. In the future, they should be able to actively step into the discussion on the field and express their opinions. However, he emphasizes, the final decision always stays with the players. Four players from Seattle Riot (Alyssa Weatherford, Kate Kingery, Gwen Ambler and Rohre Titcomb) share their recent experience with SOTG during the next panel. They say they felt the need to bring home some of what they’ve learned playing on the international level. Apparently, spirit circles were not a common tradition in the US, which often left the teams frustrated with unexpressed emotions about a poorly-spirited game. The Riot girls note their team ended second to last at Spirit at Nationals in 2010, which made them redefine what SOTG meant for the individual players on the team as well as come up with a “standard” of good Spirit. They finish by giving an example of a proper spirit circle talk. So in case, you’ve recently been running out of ideas on what to say as your team’s representative, make sure to watch the video. Make it easy for the teams to submit the spirit scores (WFDF is promising to have an app for that available on their website soon). Collect and record them consistently. Give teams access to the results and provide feedback. A panel of youth coaches is up next to bring to the table the issue of teaching SOTG to the junior generation. Matt Hill (AUS) has coached the U19 boys for six years now and says he always makes sure his team doesn’t view the other team as an enemy and tries to step in their shoes for a while. For Tasia Balding (CAN), SOTG goes hand in hand with the knowledge of rules, so that is what she focuses on with her U23 team. The help of a Rules/Spirit Captain also seems irreplaceable. George Stubbs (USA) believes that the team’s positive internal environment eventually motivates the kids to become better and more spirited players. And finally, Dan Tapuach (ISR) stresses the importance of coaches acting as role models and giving examples of good spirit behavior on and off the field. I strongly encourage everyone to watch the last three panels featuring exotic countries’ representatives talking about SOTG Around the World, coaches from Ultimate Peace and world’s best players discussing SOTG at the Top Level. You will see inspiring people, hear interesting thoughts and ideas, and maybe rediscover a part of your ultimate self that has gotten a little sleepy.